Attendees will enjoy sampling from over 100 different brands of beer, along with a free souvenir pilsner sample glass, live music, food trucks, interactive beer stations, entertainment and more. Leashed pets are welcome. Pints for Paws benefits the The Humane Society of Polk County, Inc. Your favorite pet-friendly beer fest is back for 2019 and its sixth year! 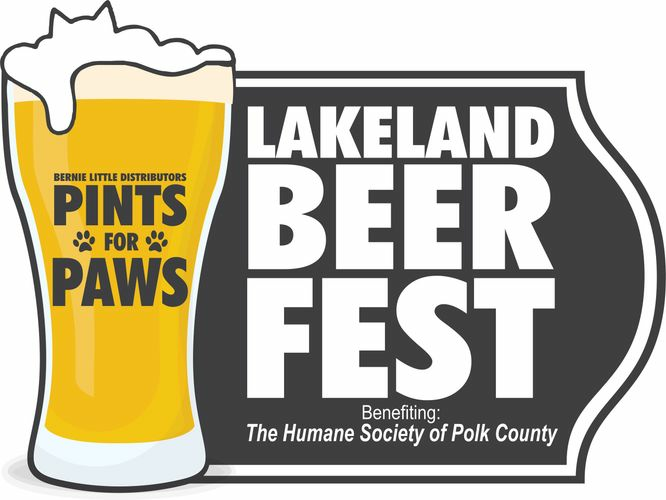 Pints for Paws Lakeland Beer Fest will be held on Friday, January 18th at the Lake Mirror Promenade in downtown Lakeland. Attendees will enjoy unlimited sampling of a large variety beer and other fine beverages, along with a free souvenir pilsner sample cup, live music from Ken Apperson and the Actual Bank Robbers, four food trucks, interactive beer stations, entertainment and much more. Leashed pets are welcome. All ticket sales are finial, Pints for Paws donates 100% of it’s the sales to The Humane Society of Polk County, Inc.
Must be 21 years and older to attend event. Pints for Paws 2018 was a huge success. Thank you to all of our sponsors and everyone that attended. Because of you all Bernie Little Distributors Budweiser was able to write a check to The Humane Society of Polk County, Inc. for $30,537.09! A: Full access to event, unlimited sampling of a large variety beer and other fine beverages (Please drink responsibly), along with a free souvenir pilsner sample cup, live music, interactive beer stations, and entertainment. A: Please! Yes! As long as your pet enjoys socializing with others and live music, leashed pets are welcome! Q: Is there an age limit and ID requirements to enter the event? A: Yes. All Pints for Paws Lakeland Beer Fest attendees MUST BE 21 years and older to enter, even if they’re Designated Drivers (DD’s) and not drinking. A valid government ID (driver’s license) is required for entry with NO exceptions. Q: Will Designated Driver (DD) tickets be available? Q: If I enter on a Designated Driver (DD) ticket and change my mind, can I drink at Pints for Paws? A: No, everyone entering Pints for Paws on a DD ticket will not be served beer or permitted to drink any alcoholic beverages at the event. Any marked DD found to be drinking will be immediately ejected from the event. Q: Can I bring my 18 year old son/daughter with me as a Designated Driver (DD)? A: No. All guests entering must be 21 years and older with valid ID. Due to current alcohol laws and safety concerns, no minors will be allowed in, which includes newborns, infants, toddlers, kids, teens or any other variation of someone under 21 years of age. Q: Can I bring my baby/young child? A: Children and infants are NOT permitted under any circumstances. We want to put the children’s safety first. Since this event does involve the consumption of alcohol and large crowds, we feel it safest to not have children attend. Thank you for understanding this is an adult only event (21 years and older). Q: Will there be food available at Pints for Paws Lakeland Beer Fest? A: Food will be available for purchase from the four food trucks that will be at the event. Q: Can I bring my own food and drink into the festival? A: No. Unfortunately, outside food or drink are not permitted into the event. Q: I don’t drink beer, will there be other alcoholic beverages included in my ticket? Q: Do I have to bring a printed ticket to the event? A: Printed or mobile tickets will be accepted for entry to the event. A: This year we will have 2 entrances. The amphitheater promenade entrance by Garden Bistro and The Circle of Mirrors entrance. A: The event will go on rain or shine! A: We apologize for any inconvenience, but just like a concert or sporting event, there are no refunds. Q: Are my tickets refundable? A: All ticket sales are finial, Pints for Paws donates 100% of its the sales to the The Humane Society of Polk County, Inc.
Q: I love your t-shirts and coozies! Will they be available at the event?